The popular Harris Centurion is a high-performance two ram baler designed specifically for medium to high volume applications. The Centurion, like all Harris two ram balers, is designed with a solid uni-body construction – a solid one-piece body design. 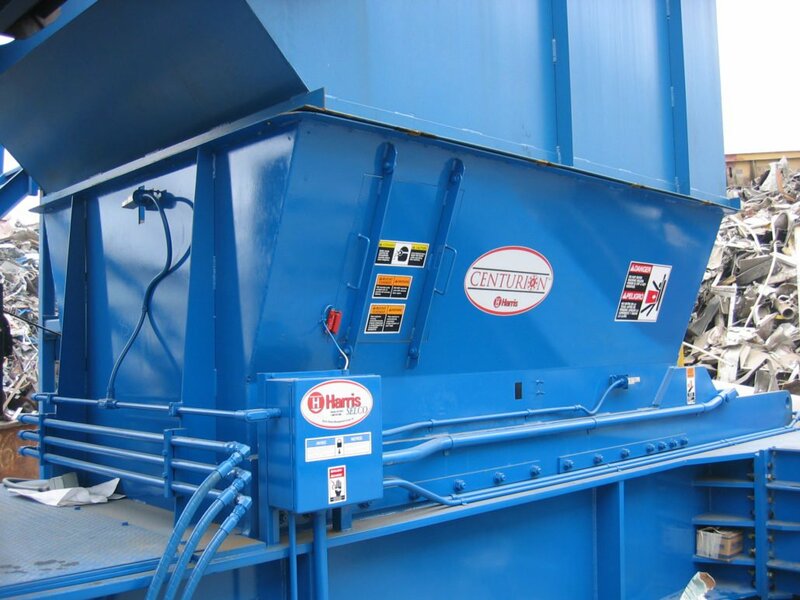 The uni-body construction design gives Harris two ram balers added strength and rigidity to handle difficult materials in difficult applications. The Centurion, and all other Harris two ram balers feature total control user interface terminals which include a multi-function touch screen display with up to the second diagnostic and production information. Couple that with a custom production system built by Harris and you will have the most efficient and productive facility around. The Harris Centurion two ram features laser guided hydraulic ram cylinders and electronic pumps for millimeter precision control on each cycle. The Centurion has additionally reinforced bale chamber with thicker and additional interlocking ribs. It also has a thicker combo-door to withstand more force. The large shear knife is both thicker and taller than traditional two ram baler knives to handle the increased shear force from the 300 ton force main ram cylinder. CHARGE BOX OPENING	 inches	 57" x 105.5"	 57" x 105.5"
HOPPER OPENING	 inches	 86" x 116.5"	 86" x 116.5"